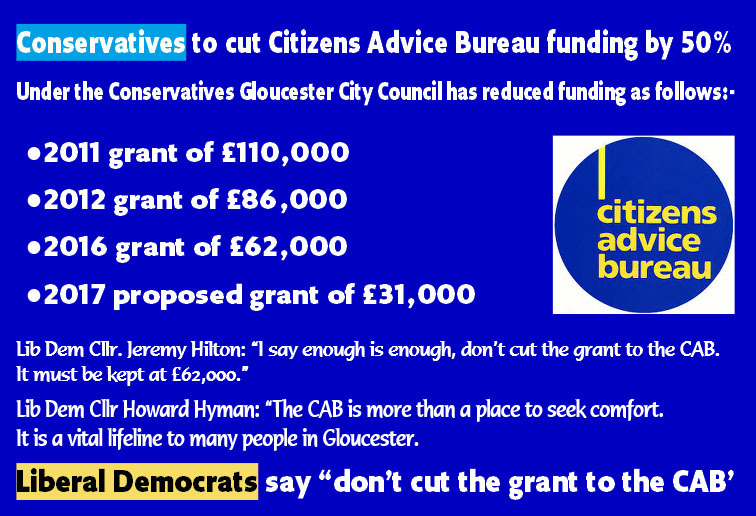 Liberal Democrats on Gloucester City Council are to oppose plans by the Tory administration to cut the grant to the Gloucester & District Citizens Advice Bureau by half. The have demanded that the grant of £62,000 is retained. The Lib Dems point out that the grant is already £48,000 smaller that it was in 2011 when the annual funding the CAB received was £110,000. 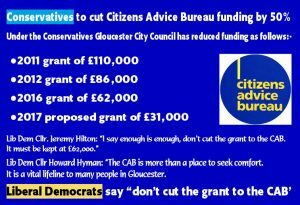 If the grant reduction goes ahead the Gloucester CAB will only get £31,000 from the city council next year. This could mean the Bureau closing one to one and half days a week. Dangerous tumble dryers prone to exploding into flames need recalling urgently to avoid people “playing Russian roulette” as new figures reveal firefighters are attending three fires a day caused by the appliances. The Local Government Association (LGA), which represents 48 fire and rescue authorities in England and Wales, is calling on leading manufacturers to recall faulty tumble dryers which have been linked to thousands of fires caused by excess fluff contacting heating elements. Government statistics show there were 2,190 tumble dryer fires between 2012 and 2014 – equating to three a day. Homes have been ruined and in some cases, the machines have burst into flames as people loaded them with clothes. An inquest has opened into the deaths of two men who died after a tumble dryer caught fire. The LGA is warning that companies who are running lengthy repair programmes for potentially dangerous machines, instead of recalling them, are risking the lives of millions of customers. It is calling on manufacturers to recall affected tumble driers and for all white goods to have fire-proof markings on them, including the manufacturer, model and serial number, so they can be identified more easily if they are damaged after causing a fire. “People using faulty tumble dryers are unwittingly playing Russian roulette and leading manufacturers need to recall affected models as soon as possible to protect their customers. “Firefighters are attending tumble dryer fires three times a day, which is alarming. These defective products are endangering lives, causing thousands of pounds of damage to homes and making people homeless. “People’s safety must be the priority. It’s been months since some manufacturers issued safety warnings over their tumble dryers but they need to be recalled as these appliances are still causing fires – until they do so, consumers continue to risk falling victim to a devastating and tragic house fire. “Fire-proof markings on all white goods would also help improve manufacturing and safety standards by helping fire investigators identify the make and model of any appliance damaged after causing a fire. “Users must take simple precautions using tumble dryers. The compartment where fibres from fabric build up should be cleaned out after every load of clothes is dried, to reduce the risk of it igniting, and the vent or any other opening should not be covered. “People should never leave tumble driers on overnight or when they go out. Anyone buying an electrical item should complete the guarantee registration to ensure goods which do not meet safety specifications are repaired, replaced or refunded. This also enables manufacturers to contact owners in the event of a product recall. Anyone with concerns about the safety of electrical appliances can report them to the Citizens Advice consumer helpline on 03454 04 05 06.